Our fully-equipped clinic was purpose-built in 2013 to offer every service you might need for injury management, all under one roof. Even better, we have lots of parking spaces so you never need to walk (or limp) far to see us. 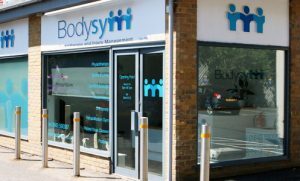 Bodysym is handily located on the outskirts of Ramsgate, on the A256 and close to major trunk roads connecting East Kent.